Please email us at troste@mchsi.com and we will be glad to assist you in checking and verifying your certificate. ﻿﻿We have released our certificate and it is getting rave reviews. We have incorporated some of the best security features in our certificate to protect the collecting public from being the victim of unscrupulous people who might want to pass of a certficate of authenticity that is not genuine. A sample of our certificate is below. Click on the certificate for a larger version. The first thing you might notice is its clean design. It is compact and contains a lot of information but is easy to follow. The actual certificate is a full 8.5 inch x 11 inch sheet with some safety features you should familiarize yourself with when you purchase, sell or receive a WBC Authentication LOA. The sample certificate above is shown for illustrative purposes only. Below we describe all the security features to look out for. The following are steps you should take each time you receive or come in contact with one of our LOA's (Letter of Authenticity) to ensure you are dealing with the authentic article and not a reproduction created by unscrupulous people to dupe or fool the public. These features are easy to detect and they make copying, reproducing or otherwise passing off non-genuine LOA's nearly impossible. Remember, if your certificate does not have even 1 of these security features on it, it is not a genuine certificate even though it might have parts of others. It is virtually impossible to copy them all and have them all on the same certificate. 1. Measure the certificate - The certificate is the same size as a standard sheet of paper, 8.5 inches x 11 inches. It is important to measure the certificate to make sure none of the certificate has been trimmed to try to defeat any of the security features by eliminating them from the certificate. While the fact that it may be the same size does not make it a real certificate by this one quick check alone, If it is not 8.5 inches x 11 inches, it is a fake certificate. 2. Look for our watermark - Each certificate has the watermark of the words WBC in a diagonal pattern. It is located on the lower right corner of the certificate. 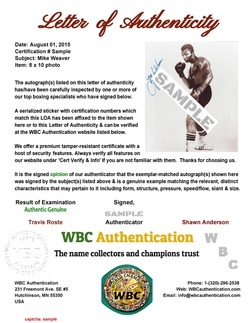 This location of this watermark is to the right of the words "WBC Authentication, The name collectors and champions trust". Hold the certificate to the light and make sure this watermark appears. Make sure it is a true watermark that is translucent to the light, and not merely light printing. A watermark is not a printed mark, but is part of the paper and is made during the paper making process. If the certificate has a different watermark which does not mention WBC by name, or has no watermark at all, it is a fake certficate. If it is printed on, and not a true watermark, it is a fake certificate. 4. Raised seal-embossed printing - On the lower left part of the certificate, there is an embossed/raised seal with WBC Authentication printing that shows we have embossed the certificate. It is located to the left of the words "WBC Authentication, The name collectors and champions trust." The embossed/raised seal has the words WBC Authentication on it. If an embossed seal is present, it may not determine authenticity by itself, but if there is no embossed seal with raised printing or it does not mention WBC Authentication, then you have a fake certificate. 5. Color - The color of the certificate is an off white, noticeably darker than a pure white sheet of paper, with almost a slight purplish tint. When you compare it to a pure white piece of paper, the difference is obvious. This is not a security feature by itself, but be aware that if your certificate is pure white, it is a fake certificate. 6. Resistant to erasures/changes. The paper we use is resistant to attempts to change the information on the certificate. The paper will smudge or appear to be stained in the area of the attempted change. If your certificate has noticeable marks/smudges/stains when you look closely at the information, it is a sign of tampering. 7. Signed by our Authenticator - Each certificate is signed carefully by one of our authenticators. If your certificate is not signed or the signature looks wrong, please contact us. Familiarize yourself with the signature of our authenticators by asking us or looking at other WBC Authentication certificates online. This is not a security feature by itself, but be aware that it helps to know this fact that each certificate is carefully signed by one of our authenticators and this signature can be checked out against others online or by asking us ourselves. 8. Other security features - There exists 1 or more other security features that we have not disclosed that can be verified if your certificate needs more inspection. Remember, if your certificate doesn't look right, contact us and we can help you determine authenticity. We are confident that the total number of security features present on our certificates make it a poor target for unscrupulous people to try to copy or reproduce our certificate for nefarious means. 9. A WBC sticker with serial number, that matches the cert, accompanies all of the inspected pieces, either on the piece, or affixed to the cert. If you receive a cert or item without a sticker on it, and it is not on the item or certificate beware. also beware of items with just a sticker and no certificate. All items should have a sticker and certificate. Remember, a clever person can possibly try to duplicate a feature or two, so because a feature may look like it is there, it doesn't mean that you shouldn't check ALL the features. 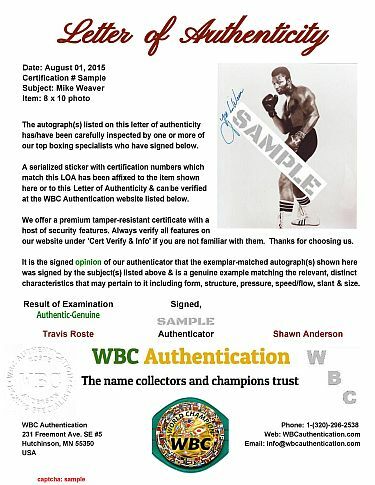 Only true WBC Authentication certificates have ALL the features listed. Please contact us if you need help verifying any certificate.